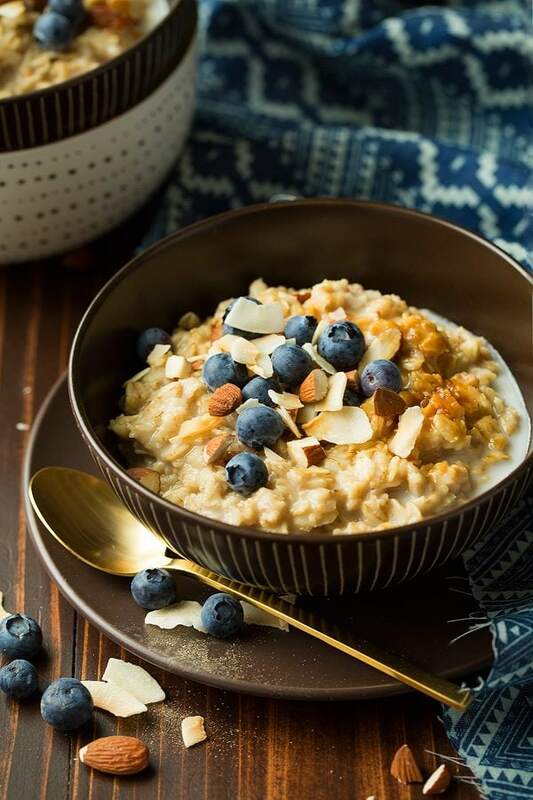 There’s nothing quite like a comforting bowl of warm oatmeal on a cold winters day to help get us going first thing in the morning. 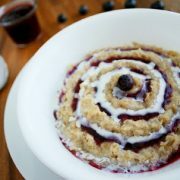 Especially when it’s as good as this Coconut Blueberry Oatmeal is! 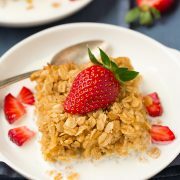 This oatmeal is perfectly hearty and filling, and is packed with nutritious ingredients. Of course it starts with rolled oats. Then instead of adding the traditional boring water or milk, I added canned coconut milk and coconut water. It gives it a unique yet delicious, raw coconut flavor, and a wonderfully creamy texture. 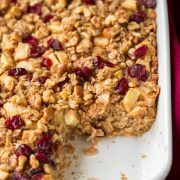 Some of you may like your oatmeal without added sugars. I haven’t quite gotten that far :) but you most definitely could omit the sweetener used in this recipe, which makes it healthier. 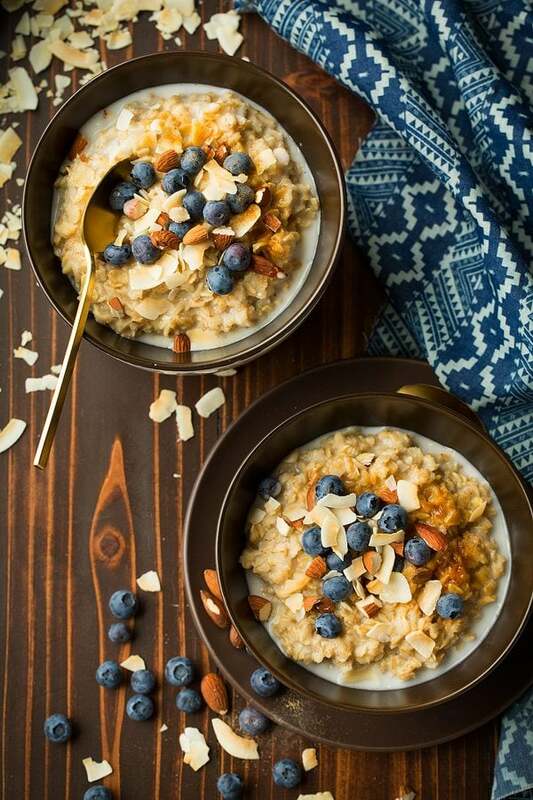 This recipe is a great way to get excited about eating oatmeal again! With oatmeal I’m always eating it in phases. I’ll eat it for a few weeks and then I’ll get sick of it and go a few weeks without, but the more variations I have on it, the more I’ll make it without getting bored. As a side note, I know fresh blueberries aren’t in season in many places right now, and they can be pricey, so you can omit them or just replace them with another fruit until Summer rolls around. But once Summer get’s here be sure to try it with blueberries, they add a wonderful natural sweetness and flavor! 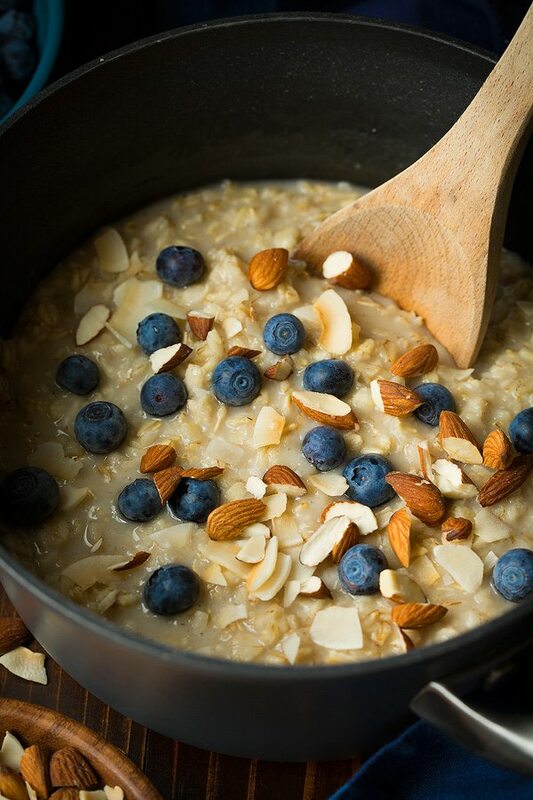 A creamy, tasty oatmeal that's loaded with blueberries, almonds and a delicious coconuty flavor. Perfect for breakfast any day of the year! 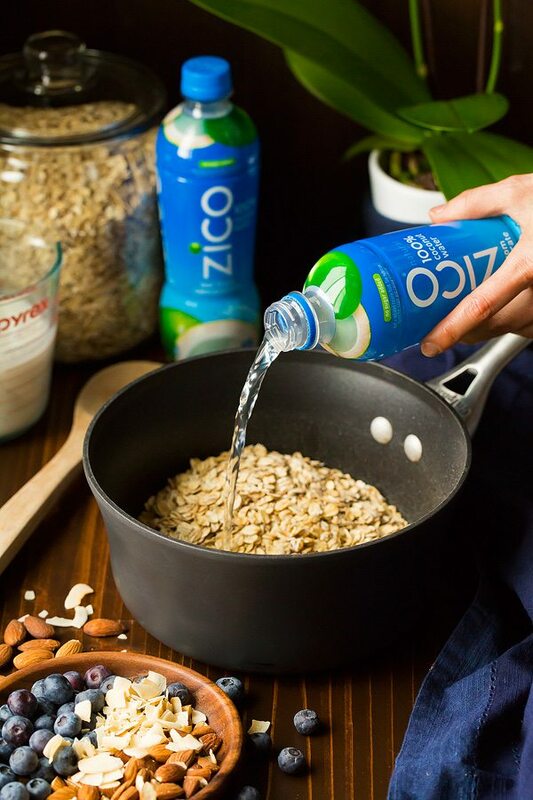 Bring coconut water, coconut milk, oats and salt to a boil. Reduce to low heat and let simmer 5 minutes, stirring occasionally. Remove from heat, stir in coconut extract and sugar. Thin with water or more coconut milk if desired. Let cool 2 minutes. 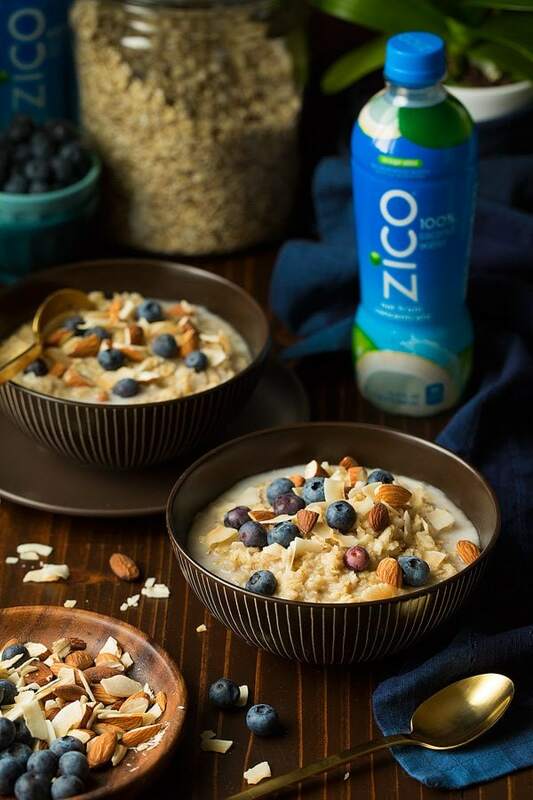 Pour into individual bowls, add another 2 Tbsp coconut milk to each bowl if desired and top each serving with coconut flakes, blueberries and almonds. Paige: This oatmeal looks amazing! i want to try it soon!